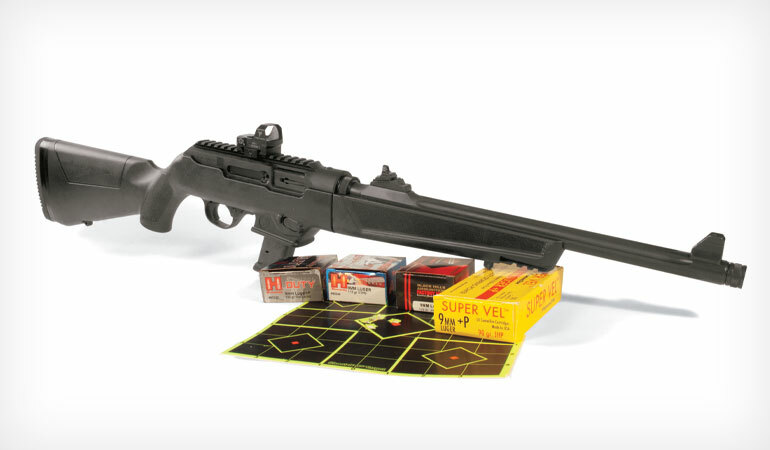 Ruger’s PC Carbine is a cleverly designed 9mm suitable for multiple tasks. It’s been more than two decades since Ruger introduced its PC9 and PC4 carbines in 9mm Luger and .40 Smith & Wesson, respectively. The goal then was to offer law enforcement a pistol/carbine pairing—a PC9, say, that would take the same magazine and ammo as the P-series semiauto handguns Ruger hoped officers would cotton to. It didn’t quite work out that way, and the carbines were discontinued in 2006. Fast forward to late 2017, when Ruger introduced its new PC Carbine (that’s Pistol Caliber Carbine, not Politically Correct Carbine). What has changed? Certainly Ruger isn’t thinking police officers are going to toss their AR-15/M4-based carbines in the trash can and replace them with PC Carbines. No, and it doesn’t need to think that way because pistol-caliber carbines are hot among the general shooting public right now. They’re a great choice for personal/home defense, and if you’ve ever fired one you know how effective (and fun) they are. 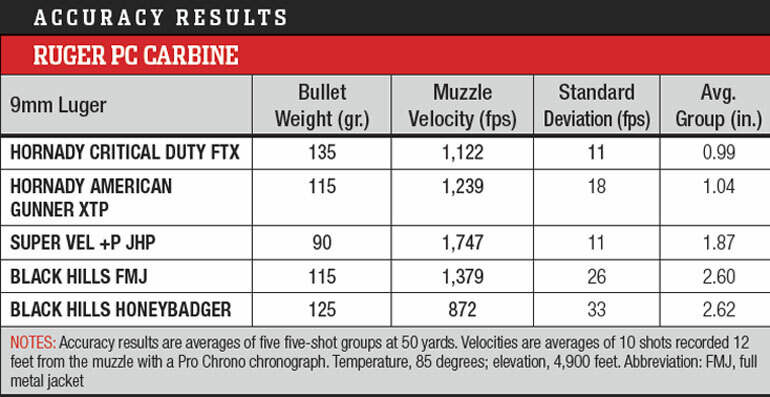 And pistol-caliber carbine is the fastest growing division in the action shooting sports. Ruger has tweaked the direct-blowback action by adding a tungsten weight (bottom) that provides a secondary blow to close the bolt—creating a softer shooting carbine. So Ruger’s timing is spot-on, as is this new design. For one thing, it’s a takedown, which increases its utility because it can be stored and transported easily. But the real genius is found in the gun’s magazine well, which can be changed to handle Ruger or Glock magazines. The PC ships from the factory with a Ruger SR9 mag well installed and a 17-round SR9 magazine in the box, but with the furnished 5/32 hex wrench and less than five minutes of your time, you can install the supplied Glock mag well in its place. (Ruger does not provide a Glock magazine, just the well.) 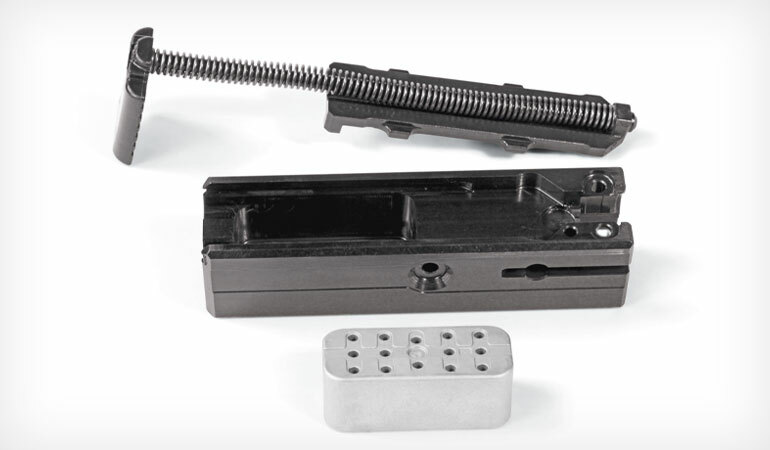 Simply loosen the carbine’s takedown screws, separate receiver from stock and swap out the mag wells. It’s super easy. Why is this significant? Even if you’re not much of a handgunner, you’re likely aware Glock is one of the—if not the—most popular semiauto handguns in the world, and Ruger’s decision to offer this option works on two levels. The receiver is CNC-machined aluminum alloy billet and includes an integral optics rail. The magazine release button and charging handle are easily swapped to either side. One, if you own a Glock, you can run the same magazines in your pistol and your PC Carbine. If you’re like me and don’t own a Glock, it still works because you can find Glock magazines everywhere, and they’re relatively inexpensive. I picked up a 15-round Magpul Glock PMag for $15 at a local sporting goods store, and if you live in a non-restrictive state, you can buy “big stick” mags with capacities in the 30-round neighborhood. Certainly there’s nothing wrong with the SR9 magazine. The one that came with my carbine ran without a hitch over several hundred rounds. But SR9 magazines (and Ruger Security-9 magazines, which also work in the SR9 mag well) sell for $40 apiece at ShopRuger.com. You can buy a mag well to accept Ruger American pistol magazines for $30, too, but its magazines also sell for $40. I did check the internet for other sources and found some of these magazines for a few bucks less, but availability was spotty. I guess it boils down to this: If you own an SR9, Security-9 or American pistol, it would make sense to have the same magazines to run in both pistol and carbine; if you don’t, Glock magazines tend to be cheaper and more widely available—with greater capacity, depending on where you live. Ruger gives you other options on the PC Carbine as well. The magazine release, which is located at the forward portion of the mag well, can be swapped to either side. It comes from the factory set up for left-side operation, which works fine for me. 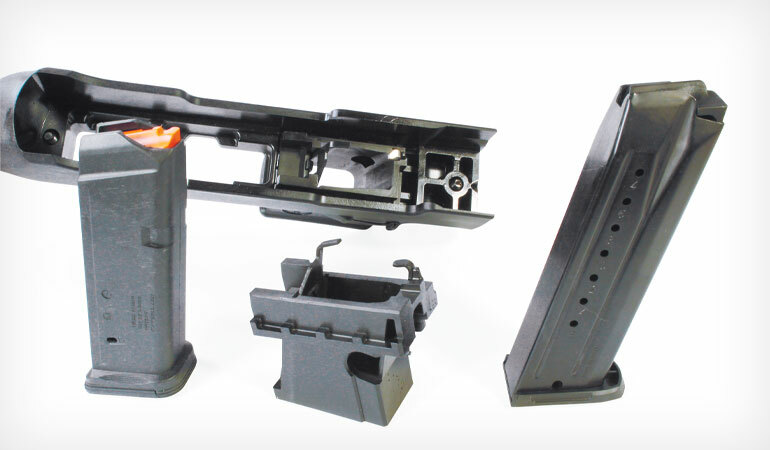 But if you want it on the other side, separate the receiver from the stock, unscrew the mag release cap, disassemble the release unit, move the release stud to the other side and reassemble. Takes only a couple minutes. The charging handle can be switched, too. With the receiver out of the stock, unscrew the charging handle and move it to the other side. The person at the factory who assembled my sample must’ve had their Wheaties that day because it took quite a bit of effort to break loose the charging handle cap screw, but after I did, the operation was a cinch. Ruger recommends checking the torque on this part every 1,000 rounds and every time it’s moved from one side to the other. While I view a lot of today’s “high speed” rifle techniques with suspicion, I found I really like having the charging handle on the left side instead of the right-side position as it comes from the factory. With my right hand maintaining a firing grip, I can strip out an empty mag, insert a fresh one and charge the rifle—all with my left hand. It’s quick and instinctive. Length of pull is adjustable as well, courtesy of stock spacers. It comes with one installed and two additional spacers in the box. Remove the recoil pad to add or subtract spacers. And what gun today doesn’t come with a threaded muzzle? The PC Carbine I tested is threaded 1/2x28, and the provided thread protector is separated from the barrel by an O-ring. If you’re going to replace the thread protector with a muzzle device, you need to remove the O-ring so the muzzle device aligns properly against the shoulder of the barrel. I already mentioned this is a takedown, and it’s the same design Ruger uses on the popular 10/22 Takedown. With the bolt locked to the rear, simply push forward on the takedown button and twist the fore-end to separate the two main components. Actually, this is one of several 10/22 design features found on the PC Carbine. The fire-control system is based on the 10/22’s, although it’s not an exact replica. It features a target hammer and Ruger’s BX disconnect. It also incorporates a unique sear that ensures the hammer will not fall if the gun is dropped, and the firing pin (which has to be different, of course) has a bulbous tail to prevent it from binding in its tunnel. However, the crossbolt safety and bolt hold-back lever will be familiar to any 10/22 owner. 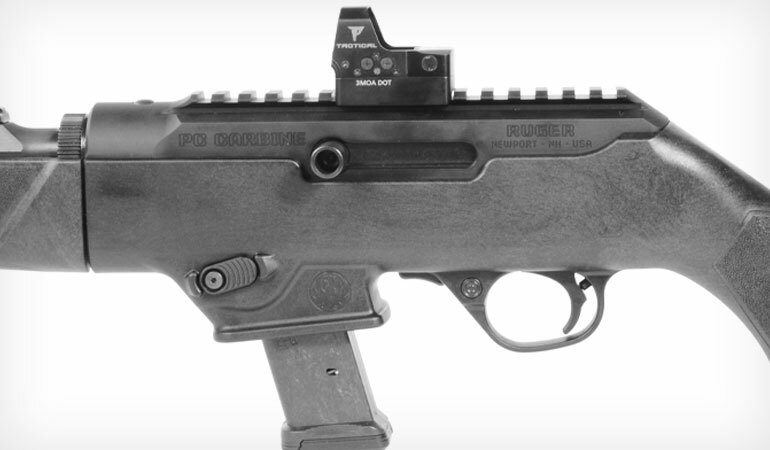 As a 9mm carbine, the gun operates via direct blowback, but here Ruger has tweaked the system, creating what it calls a dead-blow action. A 9.4-ounce tungsten weight inside the 10.2-ounce bolt (weight when stripped of its parts) slows and shortens bolt travel to the rear, and on the forward travel it delivers a secondary blow—think how a dead-blow hammer spreads out impact force—to close the bolt. The goal of this design is to create a softer-shooting gun. More on this in a bit. The reason I’m able to give you these weights is because the gun is easy to disassemble for a thorough action cleaning. Drift out the trigger pins to remove that assembly (Ruger doesn’t recommend taking the trigger group apart), then pull the buffer and its recoil spring to access the rest of the bolt parts. If the gun’s internals don’t interest you, you’ll still find plenty to like. The stock is made of glass-filled nylon, and there’s nicely tacky “stippling” on the stock’s wrist and the short, slim fore-end. The fore-end tip features a molded-in three-slot accessory rail for installing a light or laser—which is not a bad idea if you’re thinking of using this gun for home defense. There are sling swivel studs fore and aft. Up top you’ll find an optics rail integral with the receiver, which is CNC-machined from a 7075-T6 aluminum billet. The chrome-moly steel 16-inch fluted barrel sports a fully adjustable ghost ring rear sight and a protected wing front sight. At the media event where the PC Carbine was introduced, we ran Gunsite Academy’s famed Scrambler course with the iron sights, and they worked great. It’s hard to beat ghost rings when it comes to irons, so hats off to Ruger for going this route instead of buckhorns or something similarly hard to see and shoot. However, when I received my sample I immediately slapped a reflex sight—Nikon’s new Spur—on it because I think it’s the perfect match for a gun like this. And it did not disappoint. I was able to get what I consider great 50-yard groups (see the accompanying chart) with the carbine/sight combination, and the three-m.o.a. dot made hitting targets at speed on my MGM steel plate rack a breeze. The PC Carbine can be easily set up to handle Glock mags (l.) or a variety of Ruger mags, including the supplied SR9 (r.). The carbine comes with an SR9 mag well (c.) installed and a Glock well in the box. Glock magazines don’t come with the gun but are widely available. Full confession: I don’t have a ton of time behind pistol-caliber carbines, and it’s always slightly surprising to me how much recoil the 9mm generates. Now, it’s a level of recoil pretty much any shooter can handle, and the soft rubber recoil pad makes it comfortable, but there’s certainly a bit of snap when the gun fires. I think if you’re going the home-defense route, any authorized person in your house should be able to shoot it well as is—and enjoy practicing with it. But the PC Carbine would be a dream with a suppressor aboard. And if I were looking at this more as a fun gun or competition rifle, a compensator would tame muzzle rise, which isn’t bad to begin with, and really speed up target transitions. But it’s fine just as it comes out of the box. It’s light, handy and shoots well. Broken down, it would make a great take-along defense rifle for camping, vacationing and so forth. I think it’s an ideal home-defense gun because it’s easier to hit with than a pistol and less cumbersome than an AR. I’m loading up mine with 135-grain Hornady Critical Duty ammo, which shot well in my carbine and generates more than 370 ft.-lbs. of energy—thanks to the increased velocity you get from the PC Carbine’s 16-inch barrel over a pistol barrel with most loads. Further, the Critical Duty ammo is designed to meet FBI specs for performance through barriers like heavy denim, dry wall and plywood. That’s the serious side of the equation. On the fun side of the ledger, 9mm ammo is relatively cheap and certainly plentiful. Grab a couple boxes of hardball and head to the range. Actually, a couple boxes won’t do the trick because you’ll have such a blast shooting the PC Carbine you’ll quickly burn through a couple hundred rounds.